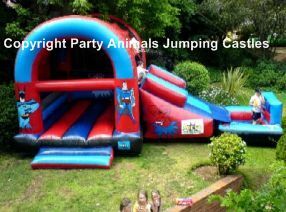 The Cartoon Super Hero I is any boy’s dream Jumping Castle. It is a 3 in One Castle: Jumping castle with roof, slide and ball pond. Also has cartoon super hero’s on castle that makes this a very popular castle. Slide extends from top wall – nice steep slide into ball pond. Can also detach the pond and let the slide go directly into swimming pool if space permits and safety is not a problem. “Coloured fun balls” are rented separately. There is +-200 balls per bag which is sufficient for the pond. The motor is a 1.1kw motor with a 15m extension lead. If your power point is further than 15m from where the castle will be placed, you need to provide an additional extension lead. These are not provided by Party Animals.